A two minutes walk from the house to the port, with quayside cafés, restaurants & a superb boulangerie/bakers, you can hire a small boat or bike or stroll along the banks of the Rance. For the more adventurous, take the boat trip or cycle to the coast, or to the Abbaye at Lehon, travelling in the opposite direction. 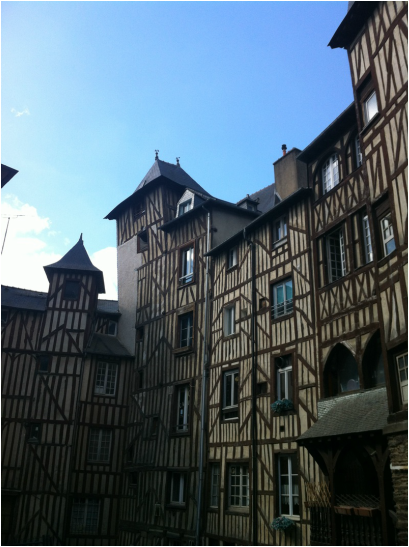 Just over the bridge is the steep cobbled street, Rue Petit Fort, which continues onto the famous, Rue Jerzual, lined with half timber houses, shops, cafés, restaurants & art galleries. Although very steep, it's a must. The Jerzual will take you straight into the centre. 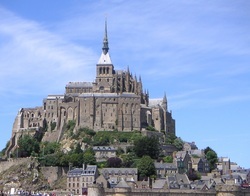 A well preserved medieval walled town, steeped in history and standing high above the estuary of the river Rance, with it’s picturesque cobbled streets, and interesting architecture, including the church of Saint Malo on the Grande Rue. A pleasant stroll around the ramparts which encircles the old town is highly recommended. 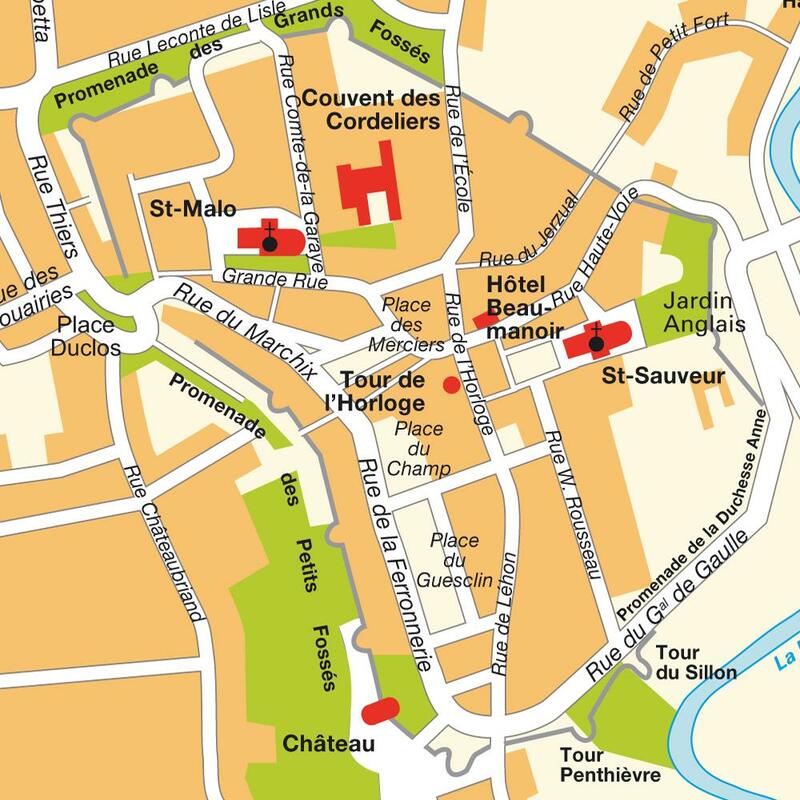 In the centre you will find many shops, bars & restaurants, a weekly market at Place du Champ Clos & Place du Guesclin & an antique market in the summer at Place St Sauveur, next to the church, Saint Sauveur Basilica. Behind here is the Jardin Anglaise/English garden, very pretty & worth a visit with fabulous views over the port. There is a small tourist train running from the centre to the port, passing all the places of interest. There is also a train station. Visit the Chateau & museum of Dinan & 15th century clock tower just off Rue de L'Horloge. Just a short distance from the parking & market area, off Rue de la Ferronnerie & just behind the walls, is the Jardin des Petits Diables. A lovely park for the children, with swings & slides as well as a variety of animals, hens, rabbits & deer, you will also find a crazy golf & a cafe. Rue de la Chaux & Rue de la Cordonnerie are the places to go for a lively night out, two small streets lined with bars. Every other year there is the Fete de Remparts, a medieval festival taking over the whole town complete with jousting competitions, visitors are encouraged to go in costume, thus gaining free entrance. There are many music festivals, in the summer, you will normally find a jazz band playing around Rue de L'Ecole, at the top of the Jerzual. For music lovers, the fete de music, in July, is very enjoyable, groups & bands take to the bars & streets to show off their talents, move from bar to bar as the mood takes you. 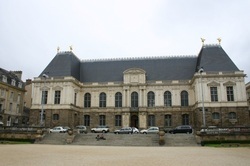 The Parlement of Brittany from a heritage and historical point of view, is one of Rennes and Brittany's finest tourist attractions. Steeped in history, this imposing law court overlooks the stately town square that bears its name, and features a wealth of 17th century French pictorial art. Visit park Thabor, situated in the centre, 10 hectares, with botanic garden, aviary, children's park & band stand. The floral circuit changes with the seasons, bulb flowers, biennials, camellias, later the roses, beds of annuals, the dahlia and chrysanthemum collections. Free admission. The Opera House & town hall, situated in the main square are superb, a beautiful ornate carousel stands in front, a perfect spot for the non shoppers in summer, lined with deck chairs, where you can sit & watch the world go by. Everywhere you look, you are surrounded by huge impressive architectural buildings. A shopper’s paradise with many good restaurants. Well worth a days visit, wandering round the ramparts and through the narrow streets, with many restaurants and bars. 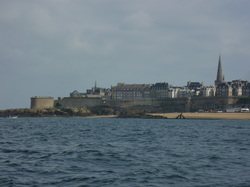 St Malo was initially a pirate port and a centre for commerce in the 16th century, it now has a marina full of beautiful yachts and pleasure boats. The city suffered extensive damage during the Second World War, but has now been painstakingly rebuilt in the original style. One of the best visited tourist attractions after the Eiffel Tower. A must to see, winding streets lined with shops, lead you up to the abbey at the peak. This area of the Cote d’Armor is extremely picturesque with many small fishing ports and beautiful golden beaches.